Keeping your business as secure as possible is one of your main concerns, and it is our number one priority. We are available 7 days a week. Call us for Seattle commercial locks change services at (206) 274-7061. If it’s your first time using Sevan Locksmith services don’t forget to check out our great online specials. We care for our customers business as we would our own; with precision, expertise, and the best products available on the market today. By staying up to date with the latest technological advances in the commercial locks change industry, we can guarantee the safety and security of your business with the best tools, hardware, and knowledge available. All of our locksmiths are fully licensed, bonded and insured for your protection, and we offer the best warranties in the entire area. Anytime you move into a new building, have a key holder leave, or have a break in, you need to call a locksmith company for Seattle commercial locks change service. Not only does changing the locks add more security, it can also help identify certain areas that may need to be upgraded in order to keep your business as safe as possible. There are many different types of commercial locks that are available to suit any need. We carry the largest selection in order to give you the best service and choices possible. Contact Sevan at (206)274-7061 for a free consultation regarding your business security needs. Commercial deadbolts are quite common and offer a medium security level for almost any business. These types of locks come in many different shapes and types, from the typical residential deadbolt to high security locks. They are easily replaced, but can also be easily broken into as they only offer a level 1 or 2 security rating. There are some commercial deadbolts that offer more security, though, such as Medeco and Mul-T locks. Our highly trained technicians are able to re-key or fresh install a deadbolt locks you like the same day you call. We provide same day service, no extra charges or hidden fees on weekends. Contact us at (206)274-7061 and get Seattle commercial locks change service at the best price you can find. Panic bars are also one of the most commonly installed types of locks on commercial buildings. These exit devices offer an easy fire exit that will automatically lock on the outside, keeping out anyone who does not have a key. However, when panic bars stop working, locking properly, or get stuck, this causes a serious safety issue that could have the fire marshal shutting down your building until it is repaired. Our expert Seattle commercial locks change team carry many different sizes of panic bars and we can repair, replace and install a new one the same day you call. Our company cares ONLY high quality products from the leading hardware companies. All types of panic bars available, from simple single door panic bars to double door vertical rod electrified exit devices. Call our Seattle commercial locks change service now to learn more about different brands and products. 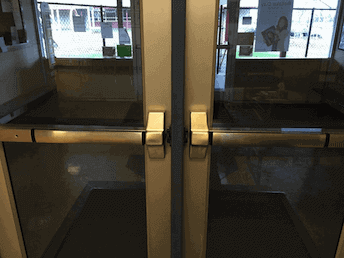 Our Seattle commercial locks change services include access control systems. Access control systems are a great way to up the security of your building by ensuring that only people with a code, FOB, or the correct fingerprint can access the secure area. These types of commercial hardware are great for any business that has a lot of people who are coming in and out of the building, if you need to section off an area for a specific security level, or if you just want to upgrade the security of your business. There are many brands and types of access control systems available. Sevan’s highly trained locksmiths can install any brand or type you like. Need a master key system? We can help! Master key systems are an easy way to add to the security of your business without having to order commercial locks change service. A master key system basically allows the main key holder to have access to any lock inside the building while giving lower level key holders access to only certain areas. These systems are great for anyone who has multiple level key holders, a lot of employees, or for those who need to make sure employees and customers can not access those areas. Our expert Seattle commercial locks change team can re-key the existing locks to a master key system on the spot. Call us today at (206)274-7061 to schedule an appointment, request same day service, or to learn more about our amazing Seattle commercial locks change services. Our team of local locksmiths are fully capable of handling any issue you may be having, and we pride ourselves in the ability to offer the lowest prices in all of Seattle. We are open 7 days a week. We provide emergency after hours service as well to insure that your business secure and safe.